Audience at 'Lake Effect On-Site: East 'Tosa' looking on as Bonnie North and Mitch Teich interview Mayor Kathy Ehley. Intern Zoe Munson recording audience members. Lake Effect On-Site: East 'Tosa, full show. 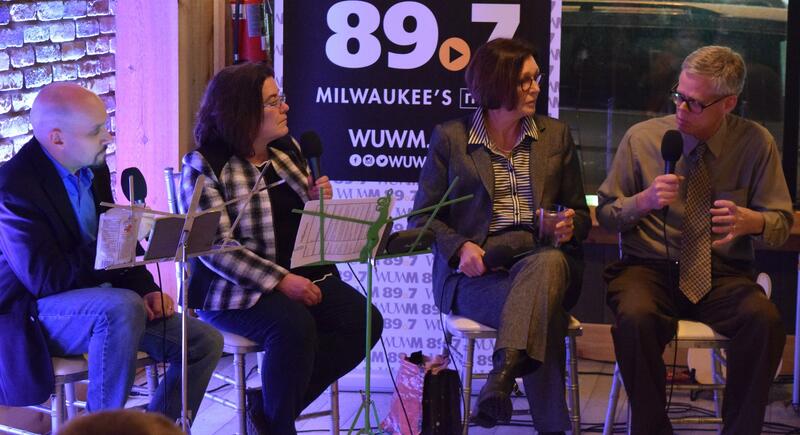 Mitch Teich, Bonnie North, Wauwatosa Mayor Kathy Ehley, and reporter Tom Daykin. A decade ago, the North Avenue corridor in 'Tosa was filled with overlooked or empty store fronts. Now the area is home to restaurants, shops, yoga studios, and even pocket parks. Much of this transformation has happened in the years since Kathy Ehley became mayor in 2012, after she served as the executive director of Wauwatosa Village's Business Improvement District. Like much of the city, 'Tosa's North Avenue corridor blends almost seemlessly into the City of Milwaukee. As the city-suburban line continues to be obscured, Mayor Ehley believes it's an opportunity for both communities to work together. She says, "We need to not worry so much about city municipal boundaries, but really support each other whenever we can. That’s what’s happening along Wauwatosa. When one area gets stronger, it spreads and it helps adjoining areas get stronger." Mayor Ehley was joined on stage by reporter Tom Daykin from the Journal Sentinel, who covers commercial real estate and development for the paper. He gives some insight on the City of Wauwatosa's history as an established city, compared to some other nearby suburbs which were created as "bedroom communities" during the post-WWII construction boom. Daykin says the city has benefitted from its location, in some ways, because it is a fairly central point in the Milwaukee area. That makes it attractive for retail. He says, "I think another part of it is that Wauwatosa has done, in the last decade or so, a good job of encouraging development that has built up its tax base." 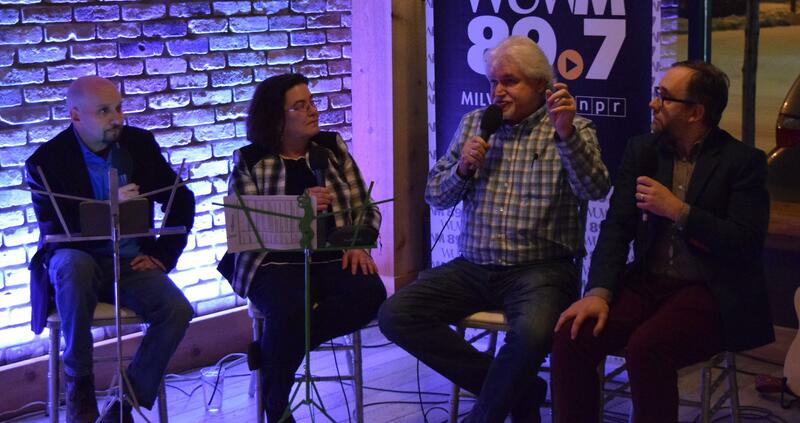 Mitch Teich, Bonnie North, with Barry Stapleton and Jeff Ksiazek from the Ward Irish Music Archives. The Ward Irish Music Archives in Wauwatosa is dedicated to preserving Irish and Irish-American music. The collection has more than 50,000 pieces, which includes, among many other items, recordings, song books, and sheet music. Barry Stapleton is the director of the Ward Irish Music Archives, and Jeff Ksiazek is the archivist. One of the big challenges is preserving the items in the collection, such as instruments and wax cylinders, which are delicate and vulnerable to damage. Ksiazek says, "[We use] archivally safe housing and store them within temperature, humidity perameters, to keep the artifacts safe. And we do the digitization to provide access and ability for people to actually either view or listen to these materials so we don't have to damage the rarer materials by repeatedly playing it or making it physically available. Mitch Teich and Bonnie North, in conversation with Mark Bearce and Nikki Barr from Kettle Range Meats. Although Kettle Range Meats is technically across the border in Milwaukee, the local butchery is being given honorary Wauwatosa status for its many appearances at the Tosa Farmers Market. Kettle Range Meats, located just south of the North Avenue corridor on State Street, specializes in ethically sourced and pasture-raised meats. Mark Bearce is the proprietor of Kettle Range Meats, and Nikki Barr works at the butchery and owns a small, heritage pork farm. Bearce says Wisconsin is a great place to sell ethically source meats, and there are many benefits to both purchasing and eating these meats. "A lot of people are interested in preserving the beautiful, rural economy here in Wisconsin - that's a way to do it. A lot of people are interested in eating healthier and they're looking for clean, local products," says Bearce. Greg Koch, Dylan Koch, and Toby Lee Marshall, playing at Birch. Throughout the night, the audience at Birch had a chance to hear the organ-fueled grooves of doom from 'Tosa's own Koch-Marshall Trio. 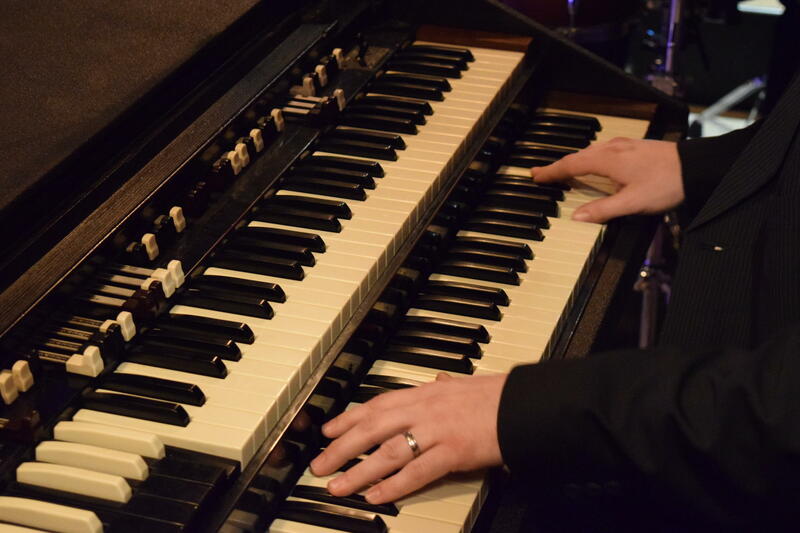 The group is made up of Greg Koch on guitar, his son Dylan Koch on drums, and Toby Lee Marshall on the organ. Since they were last in the Lake Effect Studio, the group has toured the U.S. and Europe, and is on the cusp of releasing their latest studio album. Fender has called Greg Koch one of the top 10 unsung guitarists and the sentiment is shared with many guitar geeks. 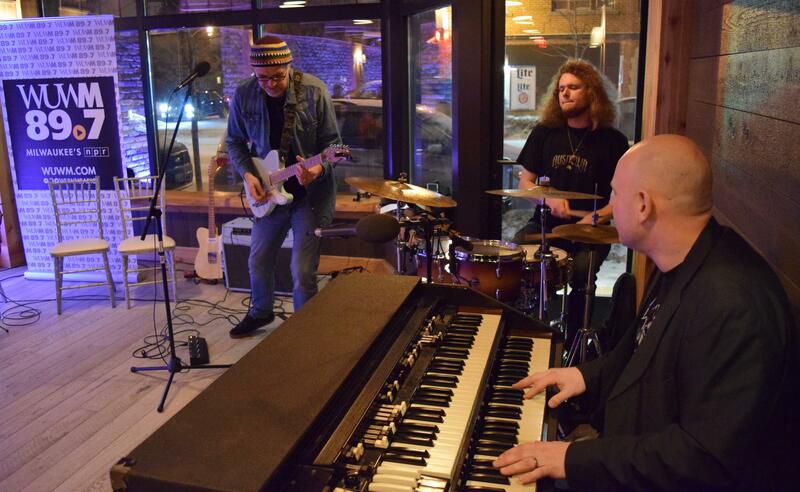 Perhaps in spite of their fame and recognition, the trio continues to live and practice in the Milwaukee-area, instead of moving to New York or LA, like many musicians. Koch says, "You know, it's a beautiful town, I grew up here, it's a good place to raise the kids... Whenever I fly home and I'm flying into Mitchell Field and I see the lake, and I'm like, 'I like my town!' Is that wrong?" Not at all. We like it, too. Extended conversation and session with the Koch-Marshall Trio. Close up photo of Toby Lee Marshall playing. Editor's note: This piece was originally published Feb. 26, 2018. For WUWM's second Lake Effect On-Site, the team headed to Bay View and paid special attention to one of the most distinctive neighborhoods in Milwaukee. For WUWM's third Lake Effect On-Site, the team headed to Riverwest to pay special attention to a unique Milwaukee neighborhood. For the inaugural Lake Effect On-Site, the team headed to the Rafters Room at Three Cellars in Oak Creek. 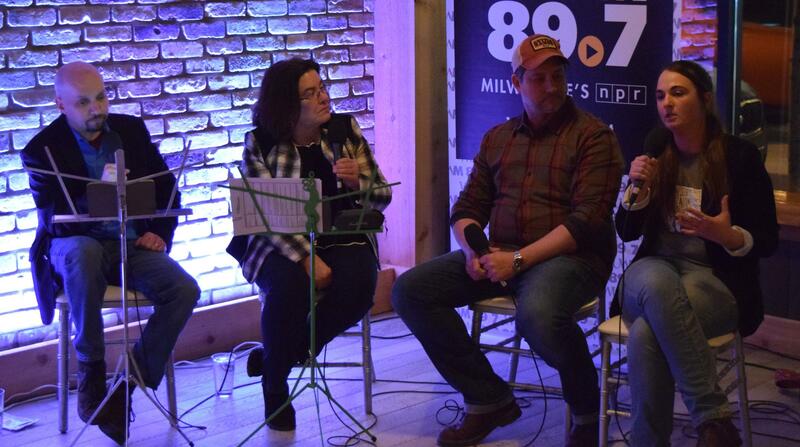 The conversation focused on this southern Milwaukee County community's rapid growth. Looking around modern Oak Creek, the huge developments taking place would have come as a surprise to the people who called the area home a hundred years ago. In fact, Oak Creek wasn’t even incorporated as a city until the 1950s.